Medical Association Recommends Extended Use of Rear-Facing Seats - Dupee & Monroe P.C. No matter how careful or conscientious parents or guardians may be while driving with their children in the car, they won’t be able to prevent every accident. What parents can do is ensure that their children are traveling as safely as possible so as to prevent as much risk of serious injury as possible should a crash happen. The American Academy of Pediatrics (AAP) has recently revised its recommendation on how best to provide for small children’s safety while riding in the car. Read on to learn about these revised recommendations, and speak with a New York personal injury lawyer if you or your child has been hurt in a Hudson Valley car crash. Proper use of a car seat or other safety device can reduce the risk that a child will suffer serious or fatal injuries in a crash by over 70%. New research has resulted in a revised understanding of what best constitutes proper safety seat use. Until recently, the AAP’s official recommendation and the requirements of New York law were the same: parents should keep their toddlers in front-facing seats until at least their 2nd birthday. 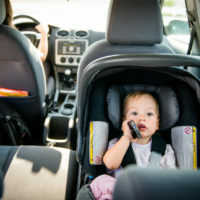 Now, according to an AAP policy statement authored by Dr. Benjamin Hoffman, the organization believes that “it’s best to keep your child rear-facing as long as possible. This is still the safest way for children to ride.” The AAP now recommends that children remain in rear-facing seats until the child exceeds the seat’s height or weight limits. Depending on the seat, this could mean that a child would ride in a rear-facing seat up to age four. At that point, the child should ride in a front-facing seat with a safety harness until they outgrow that seat, which might not occur until the child reaches a weight of 65 pounds. The author of the AAP’s policy statement explained that the last year involved a “significant change in what we know about the relative protection of car seats.” Specifically, Dr. Hoffman pointed to a lawsuit filed in Texas against a car seat manufacturer based on injuries suffered by a 20-month-old in a crash. In that case, the family succeeded in a claim for money damages against the manufacturer, successfully arguing that the manufacturer was obligated to warn customers of the increased risk of injury caused by switching the child from a rear-facing to a front-facing seat. If your child has been hurt in a New York car accident, find out if you have a legal right to money damages as a result of the crash by contacting the dedicated and experienced Goshen personal injury lawyers at Dupée & Monroe for a free consultation on your case at 845-294-8900.